The meeting was called to order by Tinker Moats. The minutes from the February meeting were read and approved. The Board Meeting Minutes from February and March were read. The Treasurer’s Report was given by Jennifer Puffenbarger. The Report was approved as read. The 2015 Annual Show was discussed. 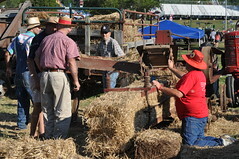 It was noted that a forklift and a rollback would be available at the show to unload tractors and equipment. The Committee Reports were given. Advertising: Ads will be placed in the local papers. The large ad will run on Friday the week before the show inside and a back page ad will run on Friday and Saturday the week of the show. It was also suggested advertising on the Community Calendar on the radio and possibly on Channel 29. 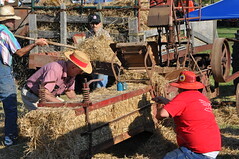 Setup: Bill Shaver and Berlin Zirk would be available at the start of the Show for setup of tractors and equipment. Members may setup Thursday evening, June 18th after 5:00 P.M..
Auction: Some auction items were on display at the meeting. Winona asked members if they knew either businesses or people that might donate items for the auction. If anyone had any information they could contact her and she would follow through with contacting them. Tinker told members that Steiner Tractors was giving a lot of hats, t-shirts, and other items as donations to our club. He also noted that vendors were asked to either give a monetary donation or an item for the auction. Activities: Bob Menifee is still working on games. 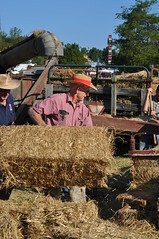 Jerry McDonald will run the square baler. A tractor with the belt pulley and belt would be provided. It was noted that we would need wire for the baler. If anyone has information about wire please contact one of the Board Members or Jerry McDonald. Relay for Life: Winona gave the report for Becky Seal. A printout was read and a copy was given to all the members at the meeting. A Schedule of Events was on the printout. Members of the Board have been talking to the Presidents of the Maryland, Pennsylvania,North Carolina, and Tennessee Clubs about how to grow membership. Jennifer said she had been receiving some applications on the web site. New Business: Jerry McCurdy passed away on Thursday, March 5, 2015. There is no other information available at this time. Steve Kegley said we would be able to rent tables from the Fairgrounds for our Show. The cost would be $9.00 per table for the three days. The discussion was that we would need 30 tables. A motion was made to rent the tables. It was seconded and approved. Jennifer reminded members that the dues were due by the end of May. She would send out reminders to members. Tinker invited all members to attend the next two Board Meetings if they wanted to–April 16th at the Cross Keys Worship Center at 6.30 P.M. and May 21st at the Fairgrounds at 6:30 P.M..
As there was no other business, a motion was made to adjourn . It was seconded and approved. Board Meeting at the Rockingham County Fairgrounds. All members are welcome to come!